I'm pretty sure you have had the sad experience of having lent some of your fave CDs and to have had them back, full of fingerprints and dusty. OK, you can wash them with water and a soft detergent but then you need to wipe them dry. So I was looking for a product that could clean and wipe my CDs at the same time: something cheap, as usual here on TNT, easily available for everyone and everywhere. So here it is: The Vileda cloth. It is nothing else than a soft grey cloth (size: 18 x 20 cm.) which is meant to clean eyeglasses. Nothing audiophile, indeed. The package contains two cloths and a small plastic bag where to store the cloths after have been used once. 3 dollars, maybe less, and you're done. One part of the microfiber absorbs the water and wipes dry the surface while the second compound takes away the dirt (oil and grease, firgerprints etc.). Have a look at the picture for details. It works excellently well and once you have tried it you won't be able to use anything else. 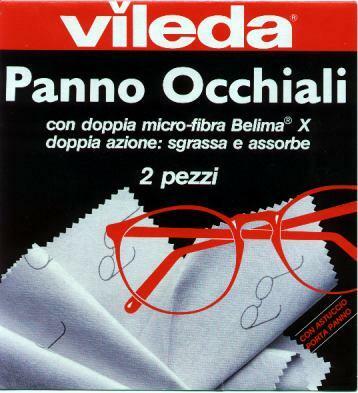 Before cleaning your CDs, test the Vileda cloth on a pair of eyeglasses (or sunglasses): it is incredible how quickly this cloth removes any dirt from the lenses and leaves them clean and transparent. Once the cloth gets dirt you can wash it a +30 C, iron it and re-use as it was new, incredible. With your CDs it is a wonder and I always keep a package of Vileda cloths both at home and into my car. Vileda is a worldwide distributed brand so I'm pretty sure you won't experience any trouble finding the cloth. Anyway, it is possible that outside of Italy it is sold under a different name. All you need to search is a microfiber dual-compound cloth for cleaning eyeglasses.